With outdoor living becoming increasingly popular the demand for the ultimate patio is on the rise. One of the first questions I get is "what type of material should I use?". In the Midwest, flagstone and pavers seem to be the most popular. I have worked with both and they each have their own pros and cons. Here are a few to consider. 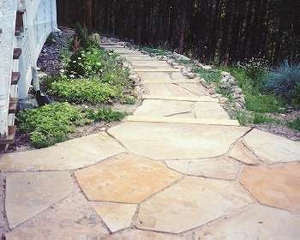 Pros: Flagstone in very durable and has a natural look. Unlike pavers a flagstone patio can be made to look like it has been there for hundreds of years. Cons: Flagstone can be a tricky surface. Each piece of flagstone can vary in thickness as much as an inch. This can be a pain when balancing patio furniture or removing snow in colder climates. There are some types of stone that can are cut so that the thickness is consist ant but the stone has to be cut and loses some of its natural beauty. Pros: Pavers are very consistent and strong. They provide a level surface with no gaps in between stone. The are easy to maintain and will last for many years. Cons: Pavers are limited as far as color choice. There are many different shapes and sizes but a paver is a paver and will never be able to duplicate the look of natural stone. There are also cost differences to consider. Since installing flagstone properly can be time consuming you can expect up to a 25% more than a paver patio. I have had some contractors say that it is easier to install flagstone over pavers but those are usually the guys who throw a few stones on a bed of sand and call it a day. 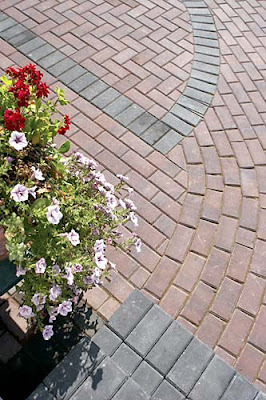 Whether pavers or flagstone you should hire a professional contractor to guarantee that the job is done correctly. If you have any questions on proper installation feel free send an email and I will be happy to help.